I went round to see my friend Catie yesterday, to update her Mac system software and make it play nice with her eyePhone. While I was busy pressing buttons and waiting for firmware updates, Catie bought some salad ingredients for a lunch al fresco. We had (left to right) a basil, mozzarella and tomato salad, hummus, pimientos (roasted, peeled red peppers), dolcelatte cheese, radishes, Spanish olives, fake caviar and live lettuce, which we snipped off with scissors. The sourdough baguette from the e5 Bakehouse in London Fields was excellent. We rubbed garlic into the bread, then tomato and drizzled olive oil over the top, to make pan con tomate. We ate in the shaded courtyard – just past the far side of the table, the sun beat down relentlessly – it was about 28ºC and humid. Drink: bottled water – I know, not like me at all! 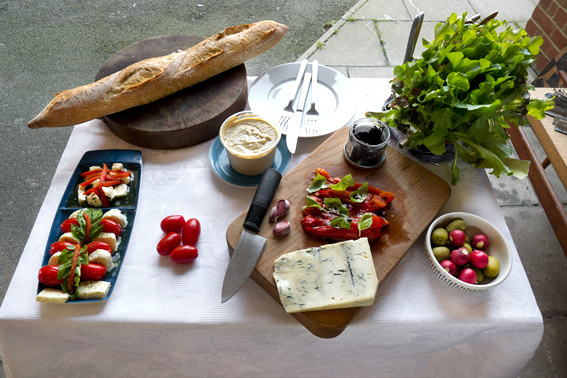 This entry was posted in Drink, Eating Out, Food, Spanish and tagged al fresco, basil, dolcelatte, e5 Bakehouse, hummus, mozzarell and tomato salad, olives, pan con tomate, pimientos, radishes. Bookmark the permalink. that’s what I love about Mac, Iphone, Ipad, IMac all play nicely together like one big happy family! Love the Al Fresco, roll on summer here. Makes my mouth water, looking at your photograph of ingredients. Mmmmm. Perfect. Thanks Cecilia – Catie’s a very good friend – I met her 100 years ago in Barcelona. Well a girlfriend did once say I was a cheese dog! Your al fresco lunch in a shaded courtyard sounds perfect on a hot summer day. This is just perfect, MD. Fresh ingredients, simply prepared. Anything more would have been too much.